Buy, Rent or Skip Made? Let's get one thing straight, Made is no Swingers, not even in the same class. There is some confusion about the two films though. 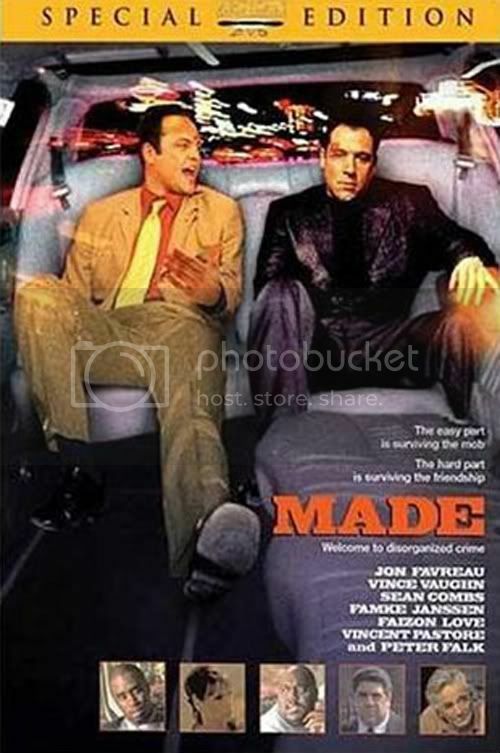 I remember when this first went into production, a lot was made about Jon Favreau and Vince Vaughn re-teaming together for the first time since Swingers. But it was made clear that this was not a sequel, but then the promotion team basically used the cache of Swingers to sell as many tickets as possible and get as many asses into the theater seats. On top of that, Vince is basically playing the same character Trent from Swingers. Hell, they even riffed on a couple of scenes from their previous movie together, albeit slightly different. Whatever you take away from these two guys sharing screen time together again, Made, at the end of the day is a story just wasn't all that interesting. Both of them get their big "break" into the life of the mafia only to screw it up time and again. But it's not even a funny screw up. It's not an screwball comedy, something that you would think would be milked a bit more, given the situation they find themselves in. As a mafia movie, this will never be in the same league of GoodFellas. As a movie on it's own terms, it's just an average one at that. This is still worth a Rent, but nothing more. It has some good moments between the two leads, just not on the same level as before.